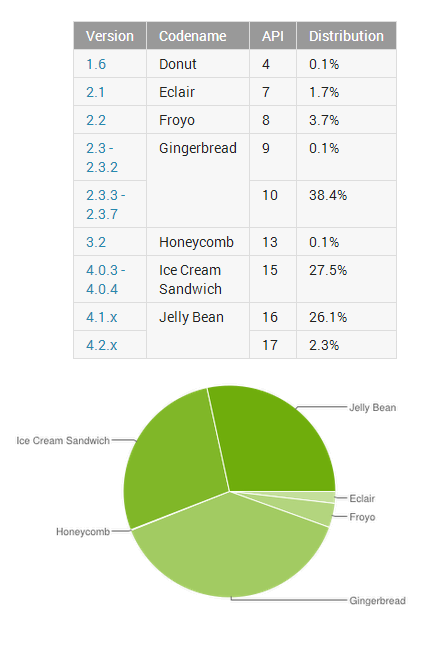 Google update the Android platform distribution chart: Gingerbread still king, Jelly Bean catching up! Everyone loves Android updates... If they have a Nexus phone, if not then you'll probably be a little bit frustrated and you'll likely end up a few versions behind unless you have the latest and greatest flagship phone. So as things stand Android 2.3 Gingerbread is still the most used version of the OS, it's probably something to do with the flood of budget handsets which rock that OS instead of something more recent. But, Jelly Bean numbers are slowing eating into that with versions 4.1 and 4.2 combining to make up 28.4% of regular users and that has beat out Android 4.0 ICS for the first time which sits at 27.5%. The interesting thing is that the amount of people running Gingerbread, Froyo and Eclair dropped 1.7%, whereas people running ICS dropped by 1.8%. 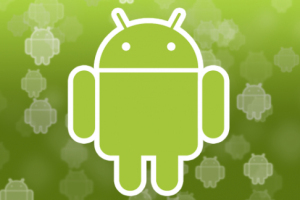 We expect the people on Gingerbread or earlier were probably upgrading, whereas the phones running Android 4.0 ICS were probably getting their updates to Jelly Bean. Motorola, LG and Sony in particular have just been catching up to the first version of Jelly Bean on handsets like the Optimus 4XHD lately! We expect to see Jelly Bean numbers continue to increase and hopefully Samsung and HTC will roll out updates to Android 4.2 in the near future for the Galaxy S3 and One X and continued sales of the Galaxy S4 and HTC One should bump people up Jelly Bean's percentages, just in time for 4.3 to arrive!